Kepler-421b: Exoplanet with longest orbital period found. An artist’s idea of what Kepler-421b might look like (the color chosen makes it look like Uranus, but we don’t actually know what color it may be). Click to ymirenate. That by itself is enough to make this an interesting object, but even cooler (literally) is where that puts this planet: Far enough from its star that it may have formed in a different way from the other planets we’ve detected around other stars. It may very well be an ice giant, like Uranus or Neptune, and not a gas giant or rocky planet. First, let’s go through the basics: The host star is Kepler-421, a star much like the Sun but a bit smaller and cooler. It’s located about 1,000 light years away, which is a fair ways (the Milky Way galaxy is 100,000 light years across). From Earth, that makes the star pretty faint. The planet, Kepler-421b, was discovered by the Kepler observatory, a space-based telescope that has found so many of the recently-discovered exoplanets. It uses the transit method to find planets; if we see the planet’s orbit around its star edge-on then every time the planet passes between us and the star it blocks a bit of the star’s light. It’s tricky; for example Kepler-421b only blocks about 0.3 percent of the star’s light. But with modern detectors, that sort of dip in light is detectable. The “light curve” for the star Kepler-421, a plot of brightness over time. The blue points are from the first transit seen, and the red ones from the second transit 704 days later. The bottom points are the residuals after subtracting a model fit to the transit curve. The takeaway: It’s a really good fit. Plot by D. Kipping et al. Generally speaking, you need three transits to be sure you’ve got something. If you see just one it could be a starspot, or some other nonplanetary object interfering with your observations. A second transit tells you the orbital period (the year) of the planet, but it could still be a coincidental starspot. If you get a third transit at the right time interval after the second, then you can be more confident. 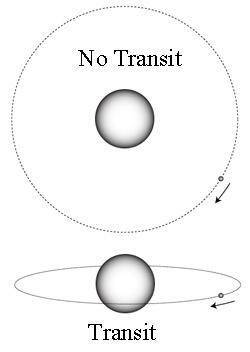 If a planet’s orbit is aligned with our line of sight, we see a transit (bottom), otherwise, we don’t (top). For Kepler-421b, the astronomers only saw two transits, which made me suspicious, but after reading their paper I’m more inclined to think they got it. The shape of the “light curve” and the incredible match between the two transits make it very likely they did find a planet. For the rest of this article I’ll just assume it exists, but remember that it has yet to be confirmed independently. Kepler-421b is about four times the diameter of Earth (judging from how much of the starlight it blocked), and has a year that’s 704 Earth days long. That’s amazing; most exoplanets found have much shorter periods, like days or weeks. That orbit puts it about 180 million kilometers (110 million miles) out from the star. Since the star is cooler than the Sun, the planet actually receives about one-fourth the light from its star as Earth does from the Sun. That’s even less than Mars gets, so the planet is pretty chilly. And that brings us to the second cool thing about this planet. Planets form from broad disks of material orbiting the star when it’s young. Close in it’s hot (duh) so you don’t get much gas or ice. The material in the disk is mostly metal and rock. Farther out there’s still metal and rock, but water is in the form of ice (this distance is called the “snow line,” a term I like), and there’s lots of it. Giant planets that form at least that far out have a lot more ice than ones farther in, and we call them ice giants. To be clear, these aren’t giant ice balls; they look a lot like gas giants but have more ice in them as opposed to rock and denser stuff. In our solar system, Uranus and Neptune are ice giants. Given Kepler-421b’s location, it should be one as well. If we assume it’s about as dense as Uranus, it has 16 times the mass of the Earth. That will likely give it a thick atmosphere (and it’s very cold, remember) so it’s not Earth-like at all. But it’s the first ice giant seen orbiting another star. We’ve seen other planets with similar masses and sizes, but they orbit closer in, and are likely gas giants. Ice giants may very well be pretty common among exoplanets, but they’re pretty hard to detect. For one, the long period means you have to wait a long time to confirm them. Also, the bigger the orbit is, the less likely it is we’ll get a transit — a planet close in to its star can be seen to transit from a wide range of viewing angles, but a more distant planet needs a more tightly constrained viewing geometry (the orbit has to be more precisely edge-on) for us to spot it. 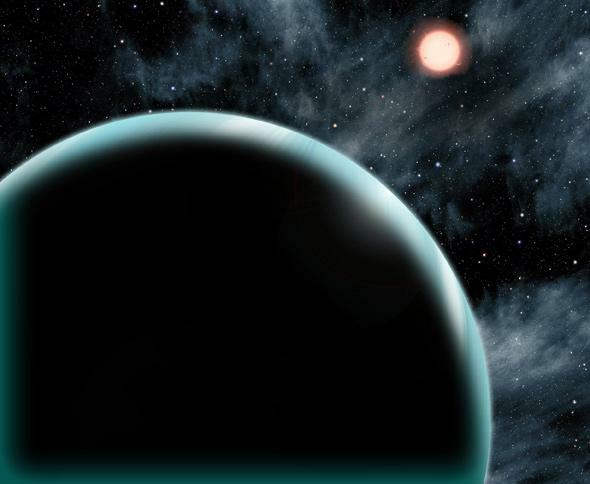 Finding Kepler-421b means that astronomers may be able to start finding more. Seeing one planet might be an anomaly, but if you find 20 more like it you can start categorizing them. This means they can use physics and models to understand better how planets form, especially that far from their parent star. We’re still figuring that out for our own solar system, so having other examples with which to compare and contrast is very helpful. And so that’s why I’m willing to write about a record-breaker, even if that record is soon broken. As usual in astronomy, I hope it is! That turns this planet from a weirdo into the first member of its class, and that means we get to learn stuff. And astronomers love learning stuff. *Correction, July 23, 2014: This article originally stated that Kepler-421b has the longest year of any known exoplanet. It has the longest year of any exoplanet found by the transit method.